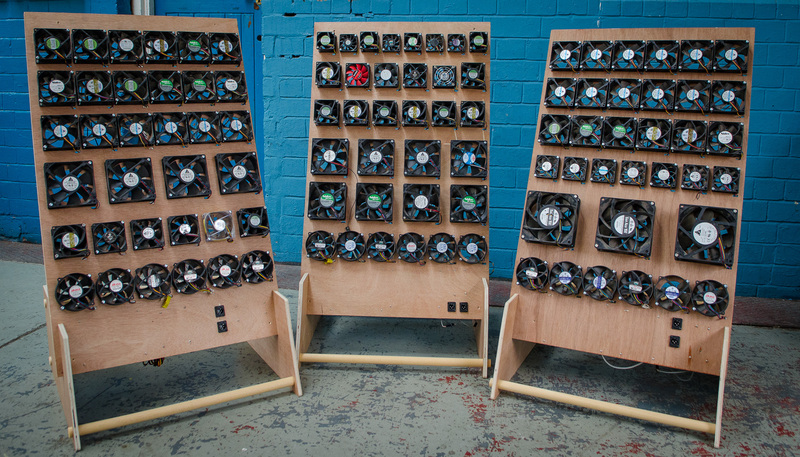 Currents is an installation and performance project built around hundreds of discarded computer fans. 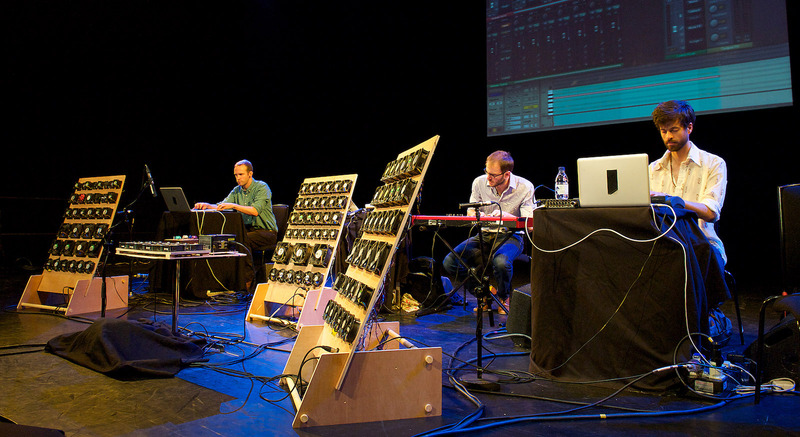 It was awarded a British Composer Award for Sonic Art in 2015. The installation is in an original Victorian police box on Easter Road in Edinburgh for the Edinburgh Art Festival, August 2014. 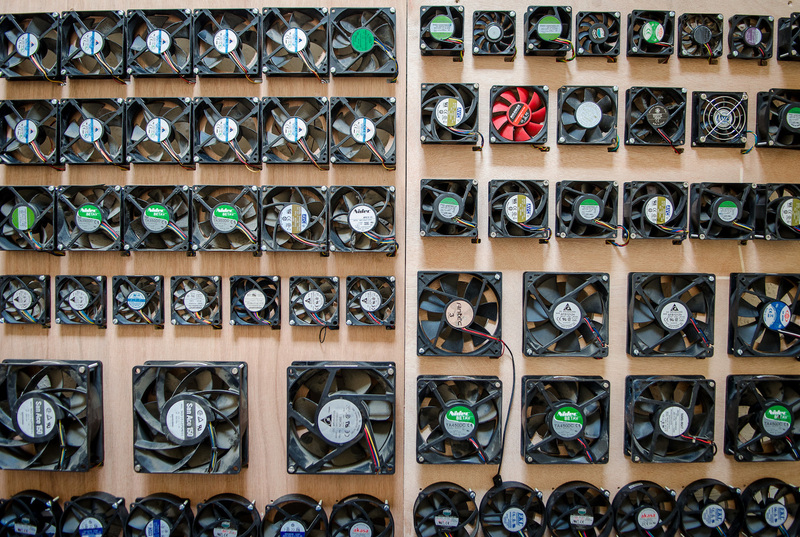 The police box is filled with 172 computer fans of varying sizes. A computer hidden in the box is accessing weather data from around the world, and the fans are recreating the wind patterns of six of these locations. The visitor is therefore briefly transported to these places by feeling what the wind conditions are at that very moment. Performances have taken place in London and Glasgow for the PRS New Music Biennial, as well as in Edinburgh for the opening of the Edinburgh Art Festival. 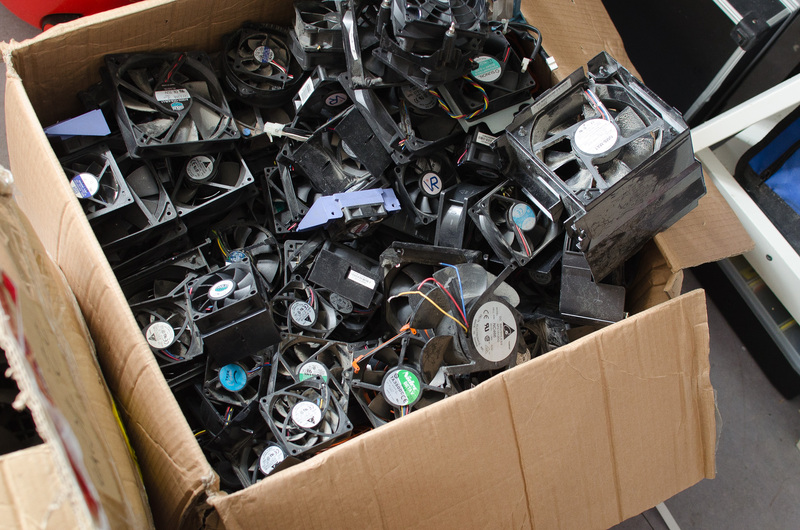 For these I turned over a hundred computer fans into several MIDI-controlled instruments, and formed a band (the Yann Fan Club) with frequent collaborators Hugh Jones and Sam Beste. We played these instruments in a semi-improvised way, occasionally accessing wind data from around the world, exploring the sound and inherently physical nature of the instruments. The composition was recorded by the BBC and played on Radio 3, and is now available for purchase from NMC Recordings. Performance photo by Elliott Franks. Currents was commissioned by Edinburgh Art Festival with the support of PRS through the New Music Biennial. This project takes in a number of themes, including our relationship with technology and the sounds it produces, global production trends, changing weather patterns, and the inherent physicality of sound. The concept was born from the idea that sound is moving air, and my desire to move air in an even more physical way.